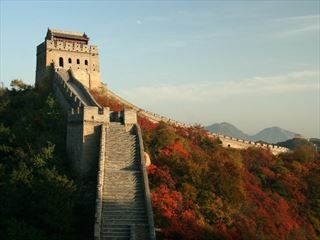 This 14 night tour encompasses the very best of China’s amazing scenery, culture and history. From the ancient Capital of Beijing, with the nearby wonder of the Great Wall and its bustling rickshaw laden streets, to the wonder of the Terracotta Army and the Yangtze’s Three Gorges, China is a truly exceptional destination. Cruise the Yangtze, enjoy time with Great Pandas and explore China’s rural and cosmopolitan landscapes which add to the fantastic experience. There are also fascinating museums, Chinese opera and acrobatics - not forgetting the delicious regional cuisine that is on offer. 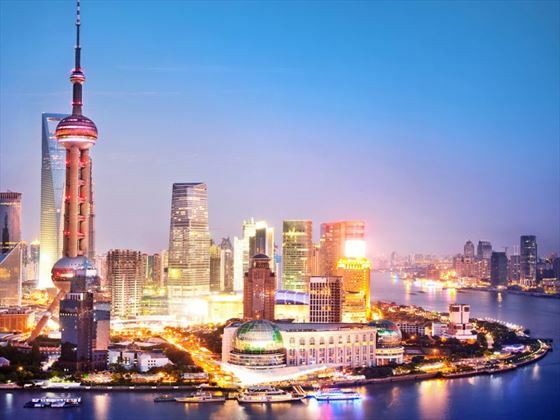 This tour starts in bustling Beijing, heads up the mighty Yangtze River before ending in the vibrant commercial centre of Shanghai, with plenty in between to offer a remarkable insight to this most fascinating of countries. Your Chinese adventure begins with your arrival into Beijing China’s ancient capital. Transfer to your downtown hotel to check in from where you can enjoy remainder of the day to explore this truly fascinating city at leisure. Today starts with a visit to Tiananmen Square where you can stroll this iconic plaza and take in the grand monuments, state building and extensive National Museum of China. 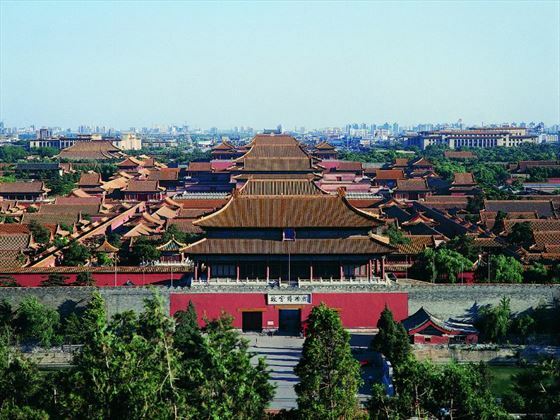 Following on you’ll head for the Forbidden City, an awe-inspiring 15th Century collection of palaces, courtyards and gardens. 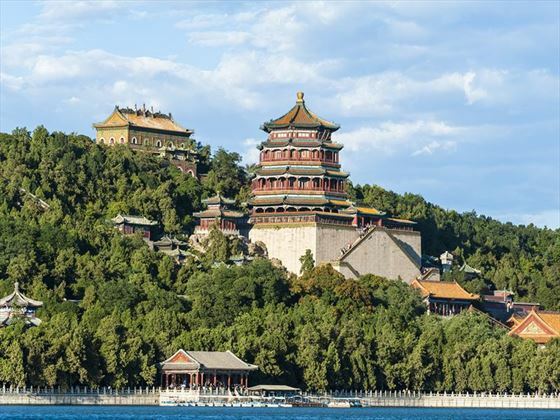 This amazing complex of edifices was once home to both Ming and Qing emperors. The rest of your day is at leisure before enjoying a sumptuous welcome dinner. Following breakfast you’ll head out to what is, without doubt, one of the great wonders of the world – The Great Wall of China. You will learn about the wall’s unique history and then get to walk the Juyongguan section, the closest part to Beijing and most famous - a truly memorable experience. Following this you will be taken to visit a jade museum where you will be able to see all kinds of jade ware and jewellery embodying thousands of years of Chinese culture. On the way back to your hotel you’ll pass the site of the Beijing Olympic Village. Today starts with a visit to the amazing spiritual Temple of Heaven, one of the most sacred places in China and designated a UNESCO World Heritage site. Set inside a beautiful park to the south of the city this complex is full of symbolism, with The Hall of Prayer for Good Harvest, the Imperial Vault of Heaven and 4,000 soaring cypress trees representing the union between heaven and earth. Later you’ll take a thrilling rickshaw ride through the city’s traditional hutong alleys before meeting a local family for dumpling making classes and Chinese calligraphy lessons. Sharing a simple lunch with the family is followed later with a traditional Chinese tea ceremony. Today you will transfer to the airport and catch your flight to the historic city of Xian, one of the Four Great Ancient Capital of China and the eastern terminus of the fable Silk Road. Enjoy an evening meal that includes delicious Shui Jiao dumplings and other local delicacies. Begin your day with breakfast, followed by a visit to the site of Xi’an’s astonishing Terracotta Army. Only discovered in the late 20th century this ancient marvel is considered as one of the greatest archaeological finds of the modern era. 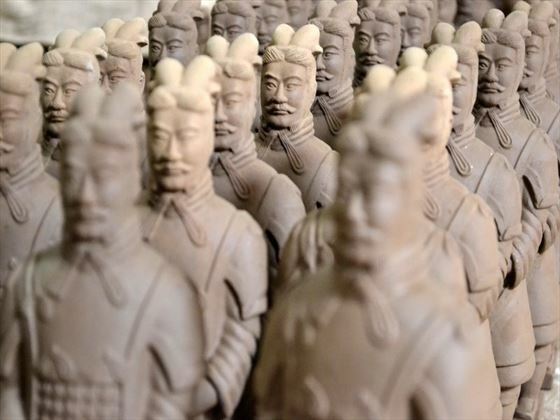 Here you will learn about the history of the vast clay army of 8,000 soldiers and how they were created to guard China’s first emperor in the great beyond. Marvel at the detailed work and unique characteristics of the life-sized warriors. 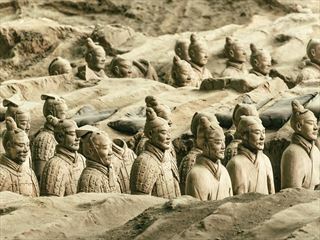 Following on you will tour the Xi’an Arts and Ceramics Exhibition Centre where original copies of the warriors are made. Lunch will include hand pulled noodles, made in-house, a specialty of the Xi’an region. You’ll finish your outing with a walk on Xi’an’s ancient city wall. Today you’ll transfer to the airport where you take the 90 minute flight from Xi’an to Yichang in the heart of China’s Hubei province. 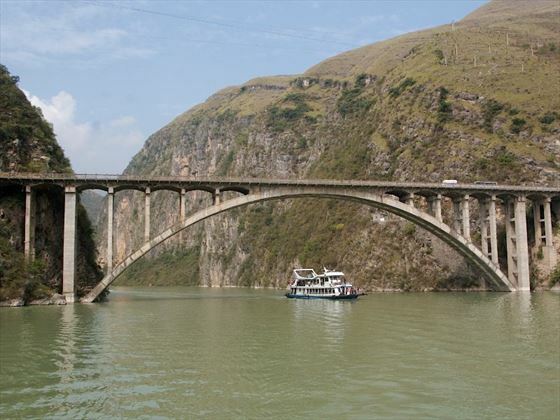 From here you’ll board your ship for the 4 night cruise up the Yangtze River. Explore the ships and relax as this exciting journey gets underway. Begin your day with on deck with an invigorating tai chi lesson whilst your ship journeys towards the awe-inspiring Xiling Gorge, the most extensive section of the Three Gorges. You’ll then get to observe the Three Gorges Dam itself, an ultra-modern facility and the world largest hydroelectric project sandwiched between breath-taking cliffs. This evening you ’ll get to join the ship’s captain for his traditional welcome dinner. Today starts with a short trip up the secluded and serene Shennv Stream in a tradition Chinese pea boat. The narrow gorges will amaze with their steep sides and stunning natural beauty. Once back on-board and continuing on your journey you’ll marvel at views as you wind your way through the magnificent Wo Gorge, known for its 12 forest-covered peaks. 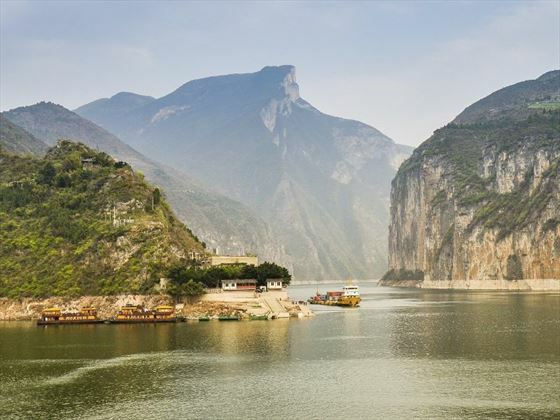 Continuing on you’ll sail through the stunning Qutang Gorge, arguably the most spectacular of China’s Three Gorges. Arriving at Shibaozhi you disembark and stroll up through vibrant market stall and across a bridge to the imposing pagoda set high in the island’s cliff face. You can climb the 12 storey structure and marvel at the colourful edifices and enjoy the panoramic vistas across the Yangtze river from the top. The pagoda courtyard is home to the famous Bridge of Luck located where you can try to cross and improve your fortunes. Disembarking at the mountain city of Chongqing you’ll make the transfer to the capital of Sichuan, Chengdu. Spend the rest of you day getting to know the city, strolling its ancient streets, taking it its renowned tea culture or colourful and energetic Sichuan opera. Chengdu is also famous for the bold flavours of its Sichuan cuisine, so be sure to sample a plate or two whilst you are in the city. Today you’ll start with a visit to Chengdu’s amazing Giant Panda Research Base. Guides will explain how the national symbol of China is being brought back from the edge of extinction. 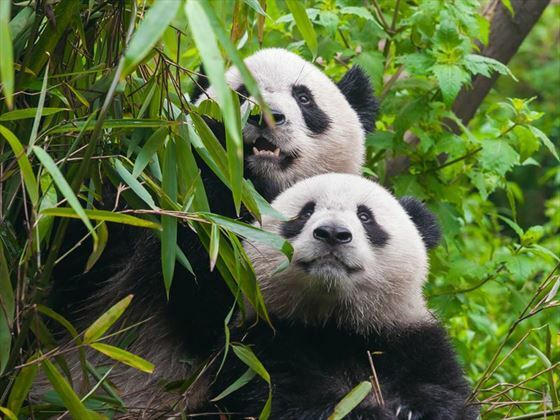 This tour will allow you to get up close to adult and baby Giant Panda’s and experience them in their natural environment. You may also glimpse a rare Red Panda whilst you stroll this amazing facility. In the afternoon you will visit Du Fu Cottage, the former home of Du Fu, one of China’s most famous poets – dubbed the Shakespeare of China. End you day at the vibrant Jinli Ancient Street, alive with vibrant shopping, dining and souvenir shops. Depart your hotel for the airport where you’ll board a plane bound for Shanghai, China’s bustling economic hub. Heading into downtown Shanghai on the super high speed Maglev train, take in the wonder of one of the most spectacular skylines in the world. This evening you’ll enjoy an amazing Chinese acrobatics show. Today you’ll enjoy a breath-taking tour of Shanghai, taking in its impressive 19th Century colonial architecture, explore the narrow streets of the city’s Old Town district and relax in the peaceful grounds of Yuyan Garden. Next you’ll head to the fascinating art and historic artefacts at the Shanghai Museum, before visiting the bustling Bund waterfront district, offering amazing skyline views out across the Huangpu River. Lunch today will be at a local restaurant famed for its delicious xiao long bao soup dumplings. 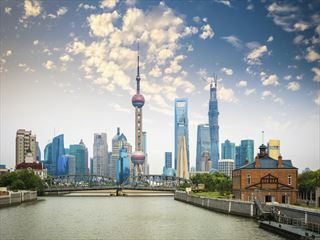 Your final activity on this amazing tour is a trip to one of Shanghai’s silk museums before you head to a well-deserved farewell dinner at a neighbourhood restaurant. Enjoy breakfast in your hotel as your fabulous Chinese holiday comes to an end.